With four champions in its last 20 seasons, and no team outside an elite group of five clubs finishing in the top three in the last 11 seasons, the Premier League has been predictable, and therefore boring, for some time. 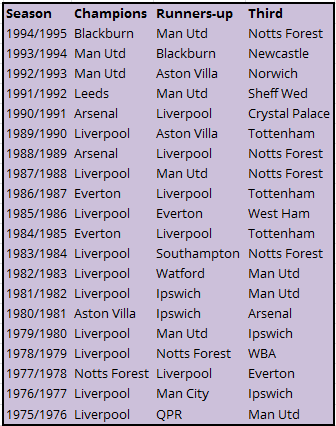 To illustrate how football has changed in England’s top division, I have divided the last 40 seasons into two. Below are the top three clubs per season since 1995/1996. During this period, just seven clubs have finished in the Premier League’s top three with that number reducing to five for the last 11 seasons. Newcastle United and Leeds United break the hegemony of “the big and biggish five” but there has been no sign of either since Roman Abramovich bought Chelsea in the summer of 2003. The destination of the Premier League title was pretty boring for the first nine years of that 20 year period too with either Arsenal or Manchester United winning it but since Arsenal’s last triumph in 2004, a new group of Chelsea, Manchester United and Manchester City have emerged, winning all of the last 11 titles. Liverpool are the only other club to figure in that latter period but their only realistic title challenge was last season and they have only achieved four top three finishes since their runners-up spot behind Arsenal 13 years ago. Compare this to the 20 year period which directly preceded this one. Between 1975/1976 and 1994/1995, 19 different clubs finished in the top three of the English top flight. Eight of these won the championship. 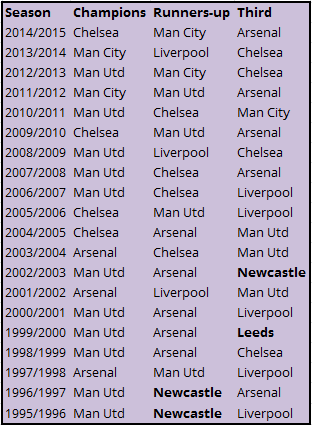 In the last six seasons prior to the reduction to 20 Premier League clubs in 1995/1996, 12 teams finished in a top three spot and there were more different champions (5) than there have been in the 20 seasons since then. Supporters of teams like Crystal Palace, Norwich City, Nottingham Forest and Aston Villa could dream of league titles and, indeed, the latter two actually fulfilled those dreams by becoming champions in 1978 and 1981 respectively. Nottingham Forest even achieved this having been promoted the previous season. A small provincial club like Ipswich Town was capable of securing a top three spot in four out of six seasons in the late 1970s and early 1980s. Unimaginable now. It is of course unrealistic to expect a return to those days. Football has changed irrevocably and there is plenty of positive change but the money flowing into the Premier League and the impact of the Champions League has, as the writer of the Telegraph article says, turned the top of the table into a closed shop. Clubs like those named above are just making up the numbers with little or no chance of ever doing better than a place in the Europa League. Even then, the likelihood of their players moving onto other, more lucrative pastures, will only weaken them for a potential Europa League campaign as will the extra matches for a team without the resources to have a squad able to play well in excess of 50 matches in a season. Once money became the driving factor for success, and a small group of clubs were in a position to get much richer than the rest due to Champions League participation, is when the Premier League became boring. It is no longer at risk of becoming boring. That ship sailed long ago. This entry was posted in Uncategorized and tagged Arsenal, Aston Villa, Blackburn Rovers, Chelsea, Crystal Palace, Everton, Leeds United, Liverpool, Manchester City, Manchester United, Newcastle United, Nottingham Forest, Premier League, Queens Park Rangers, Sheffield Wednesday, Southampton, Tottenham Hotspur, Watford, West Bromwich Albion, West Ham United. Bookmark the permalink. I’m not sure ‘boring’ really matters. In the period from 1995/1996 to last season, fan participation in the league has skyrocketed. In the list of reasons people engage with football, ‘boring’ seems pretty low. You are right, for now. I just wonder whether it may become a factor for some supporters/TV watchers.